DALLAS – The Army & Air Force Exchange Service is giving shoppers the opportunity to beat the December rush while saving big on some 300 toys with its “Christmas in July” toy sale. From July 1-14, everything from Leapsters to Legos to Barbies and more will be discounted anywhere from 25-50 percent off. Additionally, shoppers using their MILITARY STAR® card will receive a 10 percent discount on any toy purchase of $100 or more. DALLAS – Exchange shoppers can score huge savings for kitchen or laundry rooms with state-of-the-art appliances in the new Appliance 2012 catalog. This summer’s free catalog features 36 pages of high-tech solutions designed to fit home and family needs. Inside, Exchange shoppers can find eco-friendly, energy-saving and budget-friendly washers, dryers, refrigerators, ranges, dishwashers, air conditioners, vacuums, small appliances and more. Exchange patrons can take advantage of a nine-month, no-interest offer when using a Military Star® card. This special offer requires a minimum purchase of $399 from the Appliances 2012 catalog and monthly payments. Shoppers can browse the Appliance 2012 catalog online at shopmyexchange.com, or pick one up at their local Exchange. Active duty military members of the Army, Air Force, Navy, Marines and Coast Guard, as well as military retirees, reservists, National Guardsmen, Department of Defense civilians stationed overseas, Exchange employees, and their family members are all authorized Exchange privileges. Prices in this all-services catalog are valid through October 16, 2012. Pick up your free copy of the 2012 Appliance catalog at any main store or online at shopmyexchange.com. Military exchanges have the dual mission of providing authorized patrons with articles of merchandise and services and of generating non-appropriated fund earnings as a supplemental source of funding for military Morale, Welfare and Recreation (MWR) programs. To find out more about the military exchanges’ history and missions or to view recent press releases please visit shopmyexchange.com. For more information or to schedule an interview with an Exchange representative please contact Sydney Bierman, 214-312-2132 or biermansg@aafes.com. DALLAS – Three weeks after being named the first civilian Director/Chief Executive Officer in the nearly 117-year history of the Army & Air Force Exchange Service, Tom Shull officially took the reins today of the $10-billion military retailer. Shull replaced the Exchange’s last uniformed Commander, Brig. Gen. Fran Hendricks. With the official signing of the paperwork today, the Exchange has been disestablished as a major command and remains a joint non-appropriated fund instrumentality (NAFI) of the United States Army and the United States Air Force under the jurisdiction of the Chief of Staff, United States Army and the Chief of Staff, United States Air Force. Shull, a West Point graduate who received a Harvard University MBA, served in a variety of positions in the U.S. Army, including infantry company commander and assignments at the White House and National Security Council. He has served as CEO of Wise Foods Inc., Hanover Direct Inc., Barney’s New York and was most recently CEO of Meridian Ventures LLC. Shull will work with an executive team led by the Exchange’s Chief Operating Officer Mike Howard. 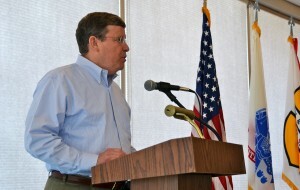 Howard has been instrumental in maintaining continuity since March 2011 when the Secretary of Defense issued a memorandum on “Track Four Efficiency Initiatives Decisions” that were “designed to reduce duplication, overhead, and excess, and instill a culture of savings and cost accountability across the Department of Defense.” In accordance with this memo, the Exchange was directed to convert the Commanding General’s position from that of a Major General to a Senior Executive Service civilian. DALLAS – The Army & Air Force Exchange Service is offering shoppers a chance to accelerate summer fun by winning a new Harley-Davidson motorcycle. For a limited time, military shoppers can cruise over to their local Exchange and enter to win in the “7 Up Harley-Davidson Sweepstakes.” One lucky Exchange customer will win a 2012 Harley-Davidson® Sportster® Forty-Eight™. Entry is limited to shoppers 18 and older who have a valid driver’s license. “We expect this contest will get shoppers’ ‘motors running,’ so anyone interested in winning should get in gear and take a ride to their nearest Exchange,” said the Exchange’s Chief of Staff Col. Thomas Ockenfels. Shoppers can enter to win the 2012 Harley-Davidson® Sportster® Forty-Eight™, valued at $11,000, in stores only from June 15th – 28th. DALLAS – Stock assortment selections are an important subject for both the Army & Air Force Exchange Service and its customers. Spotting hot trends and getting those items quickly on the shelves is a daily mission. In fact, the Exchange is setting a new standard in data collection through partnerships with Nielsen and the NPD Group, globally recognized leaders in consumer and retailer market research. These relationships provide access to raw data, analysis tools and other additional services such on-site representation at Exchange headquarters for one-on-one training with Buyers. In addition to research, the merchandise selection process is determined by several factors. Buyers meet with suppliers at trade shows as well as vendor and Exchange offices to review product lines. They review trade magazines, attend trade shows, review competitive weekly tabloids and visit the competition. The Exchange also utilizes category management and outside consultants to ensure stock assortments reflect industry practices. Store input and feedback are also critical factors in product selection. The Buying Teams conduct quarterly conference calls to designated facilities and participate in “Meet the Buyer” visits. During these meetings, buyers frequently walk various departments to ask shoppers if they are able to find the styles, pricing and sizes they are looking for and find out what patrons would like to see added to their Exchange’s stock assortment. Satisfying all Exchange customers in regards to merchandise assortment is an ongoing challenge, but one the organization continually works to achieve. In the event that a shopper is looking for a particular product or brand, they are encouraged to talk with their local store management to discuss the specific items they would like made available.